The Ministry of Electronics and IT, the key Ministry spearheading Digital India and Digital Payments is also focused on health of their employees and on Environmental Health! 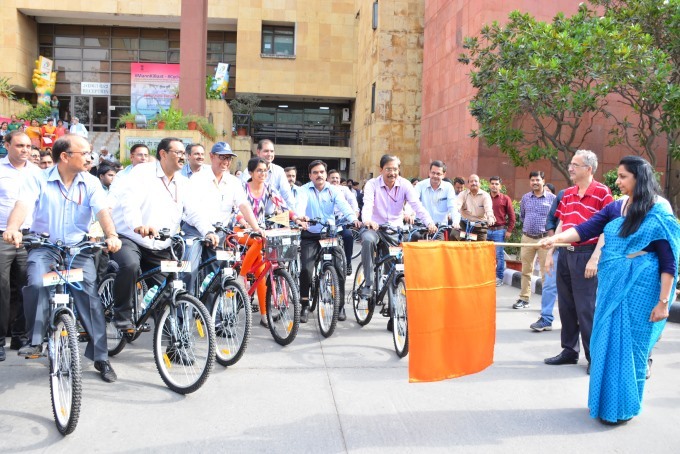 The National Institute of Electronics and Information Technology (NIELIT), a key part of the Ministry of Electronics and Information Technology has encouraged all its employees to pledge to ride a cycle to work, at least one day in a week. The Initiative #Cycle2Work aimed at fitness and well-being of the employees for greater productivity, adoption of Eco-friendly means to commute and combating pollution in Delhi through reduction of greenhouse gas emission for a cleaner and greener India. The campaign is in line with Prime Minister Shri Narendra Modi’s vision in ‘Mann Ki Baat’ that Government officials should prioritize taking care of their health for better productivity at work, and cycling to work at least once in a week could be one of the steps in this direction. Commenting on the initiative, Dr. Ashwini Kumar Sharma, Director General, NIELIT noted, “We are proud to have initiated the #Cycle2Work practice. This will have a positive impact on health, and attitude of the employees towards work, and eventually develop cohesiveness among them. This initiative is expected to have a nationwide cascading effect and will encourage others to follow, which will collectively contribute to the Hon’ble Prime Minister’s vision of a ‘New India’.